Catching big fish successfully requires that you have a great casting rod in your hand. If you want to go after trophy fish and experience the excitement the challenge brings, equipping yourself with one of the best baitcasting rods will give you the confidence to go after them, set you up for success and make fishing an absolute pleasure. Baitcaster fishing poles may have a steeper learning curve than spinning rods but once mastered, they offer the best fishing experience. It’s no wonder that experienced anglers prefer them. Whether you’re adept at using casting rods or looking for your first baitcaster ever, you need a well-constructed rod that feels good in your hand and offers the right combination of power, action, length and other features for your fishing style. It will enable you to accurately cast heavier lures and have the backbone to pull larger, heavier fish from deep water and heavy cover. We’ve created this page to make it easy to find the best baitcasting rod for the job. We’ve reviewed the top ten best casting rods and then explained what you need to look for when choosing a baitcaster pole. First of all, here are the top rated casting rods that deliver exceptional performance, reliability and value. As you will see, you don’t have to spend a fortune to get a great casting rod. The legendary Ugly Stick fishing rods were first introduced in 1976. This new generation of the Ugly Stik maintains the strength and durability of the original with improved components that enhance their quality, reliability, and durability. They have a lighter and balanced feel for fishing comfort and a modern matte finish. All these at a phenomenal value. Whether you are a beginner or an experienced angler, it is hard to go wrong with the Shakespeare Ugly Stik GX2 rods. They are virtually unbreakable and their performance is at the same level as rods that costs 2 to 3 times as much. With these rods, there's no worry of breaking allowing you to relax and enjoy myself when out on the water. These rods feature the brand's Ugly Tech construction and a new blank through reel seat design. The blanks are crafted from a combination of Graphite and fiberglass creating well-balanced poles that are strong and durable as well as light in weight and also sensitive. The stainless steel guides with a one-piece design without pop-out inserts add to this durability while minimizing line issues. The brand's iconic clear tip design has strength and sensitivity, so it has the power to handle larger fish and the responsiveness to detect even subtle bites easily. They're ergonomically designed to be well-balanced with a lighter feel for ease of use. Durable and lightweight EVA handles offer the firm, comfortable grip you need no matter the conditions. You can use it for hours without fatigue or discomfort slowing you down. The extended handle design room to get the firm grip and leverage you need. Out on the water, their action doesn't disappoint and you can expect a smooth and reliable performance every time. Once you have your GX2 rod set up with a compatible baitcasting reel and your preferred fishing line - you can use these casting rod with any type of fishing line - you'll love its flexibility and sensitivity but it's also stiff enough with enough strength and backbone to handle medium to heavy fishing tasks without breaking. KastKing has established a solid reputation for quality fishing gear that makes fishing fun. 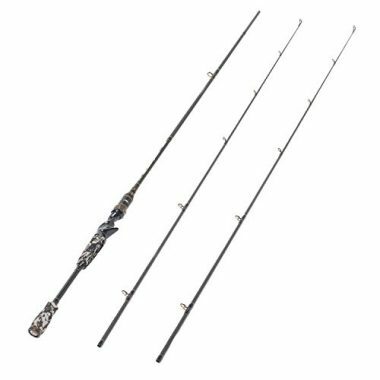 These top rated KastKing Perigee II baitcasting rods deliver a flawless performance that makes fishing excursions successful and enjoyable. These rods have affordable price tags but the quality, feel and action is at the same level as more expensive poles. The twin-tip styles offer fantastic value as each pole comes with two tips. You get to choose between a medium light power with a medium tip and a medium power with a medium heavy tip. 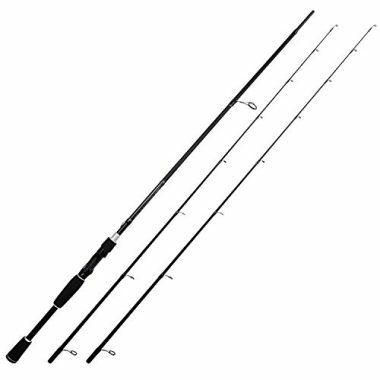 The 1-pc rods come in 6'7", 7'1", 7'4" lengths and medium, medium light and medium heavy powers. 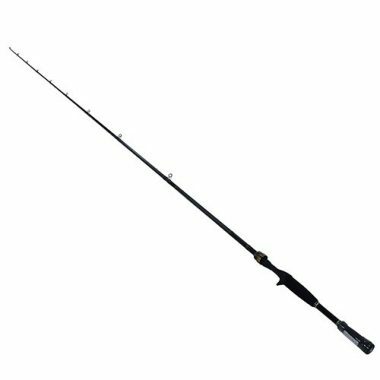 The twin-tip casting rods are 7' inch long and feature 2pcs construction with Mh & M, Ml & M, and M & Mh tip options. 24 Ton carbon fiber blanks have power and durability, the kind of strength you need for heavy fishing tasks while keeping the rod lightweight for ease of use and sensitive so you can feel everything and set hooks accurately. It features Fuji O-ring line guides, which are considered some of the best today. 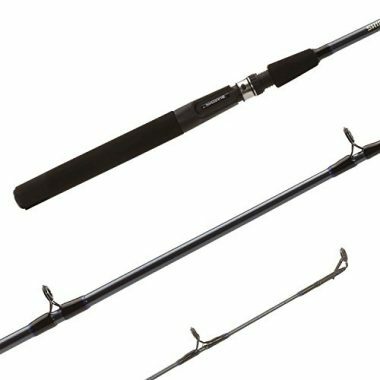 For the portable 2-pc rods, KastKing uses a special joining technology to keep the power flow continuous, so they perform and feel as smooth as one-piece poles. The other rod components are top quality: ergonomic graphite high-strength reel seats, high-density EVA grips, and Saf-T keeper hook holder. This offers durability, reliability and a smooth experience when casting or fighting fish. Casting with these rods is very smooth and accurate. Even in windy conditions, you can present light or heavy lures exactly where you want them to fall. The fast action tip takes your lures far away and makes feeling even the slightest of bites easy so you can set the hook successfully. The rods are powerful with plenty of backbone to pull some good size fish from heavy vegetation. 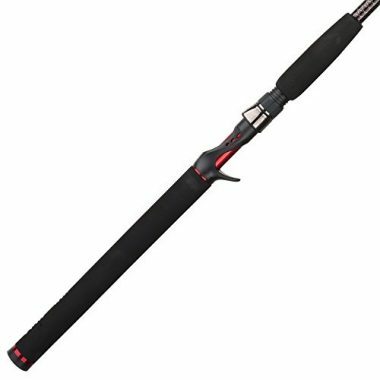 High quality construction, medium powers and variety of styles mean you can find a rod with the kind of features and performance you need whether you'll be going saltwater fishing, freshwater fishing, or kayak fishing, for bass, trout, cat, and many other species and techniques. This is an iconic baitcasting rod by Berkley redefined to meet the needs of modern anglers. Hybrid crafting, cork handle, incredible sensitivity, attractive pricing make this one of the best baitcasting rods for freshwater fishing. It also looks great and is a pleasure to fish with. Whether you're looking for your first baitcaster rod or need a backup, these are nice quality rods and amazing bargains. 5'6", 6', 6'6", 7' lengths, medium light, medium, and medium heavy powers, 1pcs and 2pcs configurations. Graphite blank and hybrid through-handle blank construction gives the pole strength, durability, and sensitivity. It features well-constructed SS304 line guides that are 20x tougher and 55% lighter than traditional aluminum oxide guides and have passed rigorous tests for dependability. The handle is cork which not only looks good but also offers a comfortable grip and adds to the rod's tactile features. 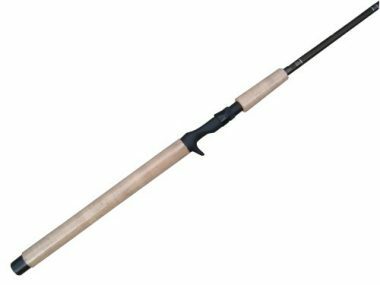 The rod has good action and is great for bass fishing, catfish fishing, kayak fishing and more. It offers great sensitivity and you can feel every little thing and it has the strength to bring a variety of fish in. The lightweight construction plus the handle material and length makes the rod nice and comfortable so it feels good in your hands even when casting and retrieving for hours. There are some complaints about breakages but this shouldn't be a problem as long as one understands the rod's limitations and how to use it correctly without testing its limits. These rods aren't designed for heavyweight fishing but they are quite capable just in case you hook a bigger fish. The first thing you will notice about this casting rod is the cool, unique look but it has a lot more to offer when out on the water. It's a responsive casting rod designed to offer comfortable, successful and enjoyable fishing experiences. Its quality and performance are good for the price. Another outstanding feature is the value and versatility it offers, as each rod come with two tips giving you two rods with different powers for the price of one. A lot of thought has gone into making this casting rod strong, effective and comfortable. It is composed of a structurally enhanced 24 Ton carbon fiber blank which maximizes its lightweight comfort, strength, and sensitivity. It has 6+1 corrosion resistant “K-R” and “FINESSE” guides positioned in such a way as to ensure friction-free line flow and offer optimal casting performance. They are also coated to improve their overall drag and friction. 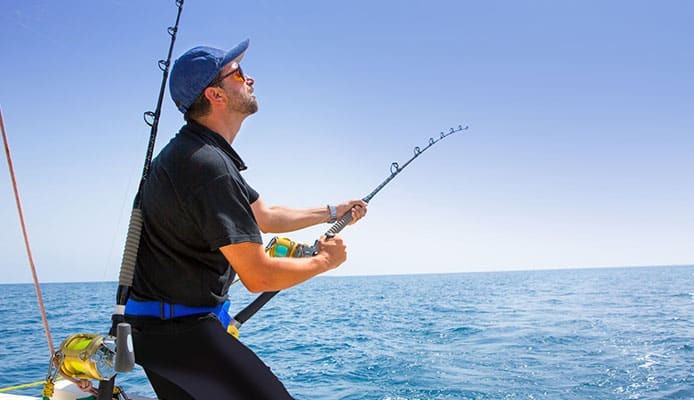 The reel seat has corrosion resistant aluminum hoods and an ergonomic design that allows direct contact with your fingers so you can detect every bite. The enhanced notched reel lock ensures that once you lock your reel down, it'll stay securely attached. High density split-grip EVA handle gives adds to the sensitivity and durability of the rod while giving you optimal control and comfort when casting and retrieving. Long days spent on the water won't leave your wrists aching. Each pole comes with 2 tips, medium and medium heavy. You're getting 2 rods for the price of one. All you have to do is switch the tip to suit the kind of power you want for the type of fishing you're currently enjoying. The only complaint here is that the tips are delicate and break easily. The rod is fast action and casts great. A good ratio of rod to handle offers a great feel and provides for comfortable casting. It has incredible sensitivity so that you can feel what's happening to your lures easily and never miss setting the hook. With a medium heavy power, it has the backbone and leverage to pull in some big fish. With the Torrent, Piscifun offers a great quality and high-performance pole with everything an angler needs in a baitcaster rod and at an affordable price. Its quality and performance are hard to beat at its price. Medium length and powers make it a great all around rod and it performs well in both freshwater and saltwater environments. If you're looking to get into baitcasting, this is a great starter pole. Even serious anglers looking for a backup rod will be impressed with it. Medium-heavy power with 8-17lbs line weight and 3/8-3/4oz lure weight rating and medium power with 6-15lbs line weight and 1/4-1/2oz lure weight rating. This is a 6' 6" long composite rod created from both graphite and fiberglass. The result is a well-balanced rod that is lightweight and sensitive and also very strong and durable. The line flows through stainless steel guides reinforced with Zirconium inserts to ensure the line flows smoothly. The rod is lightweight and feels balanced in your hand. You have a lot of control and flexibility when fishing while minimizing fatigue. An EVA foam handle offers a firm and comfortable grip during fights. The full length provides a lot of space for a comfortable grip. This casting pole is top rated for its performance. With its medium or medium heavy powers, it has plenty of strength and backbone to pull big fish out of heavy cover. The fast action tip and graphite composition give it amazing sensitivity so it transmits even the faintest nibbles at the end of the line and accurately set the hooks. The fast action tip also delivers great casting distance and accuracy. As you can expect from Abu Garcia, this stylishly designed and light baitcaster rod performs excellently on the water. One of its outstanding features is how lightweight and balanced it feels. You can expect long fishing days using this rod to be comfortable. 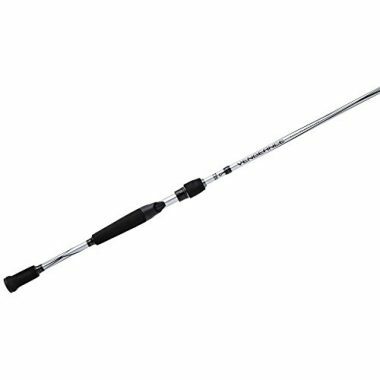 This is a versatile and adaptable fishing rod equipped to suit a variety of fishing situations. This makes it a great multi-purpose, all-around rod for beginners and anglers on a budget. For the price, it is one of the best baitcasting rods you can get. 6'6", 6'9", 7', 7'6" lengths, medium, medium heavy and heavy powers. This rod is crafted in such a way as to make it lightweight, balanced, sensitive as well as extremely strong and durable. 24-ton high modulus graphite blank makes for a durable rod that feels balanced in your hands and is responsive. 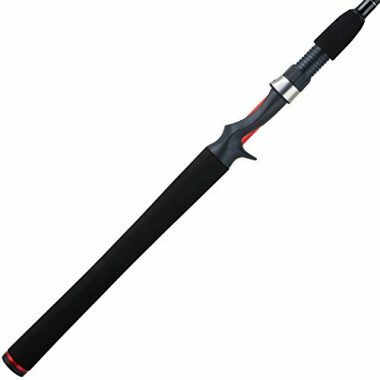 IntraCarbon construction featuring very thin layers of multidirectional carbon fibers enhances its break strength making it one tough fishing pole. Stainless steel guides with titanium oxide inserts add to the durability and also ensure smooth line flow no matter what type of fishing line you prefer to use. One-piece aluminum screw down hood creates a secure connection. It also features a Texas-rigged hook keeper that accommodates all kinds of baits. High-density EVA split-grip handles give you the comfort and leverage you need to fight fish without fatigue and ensures a firm grip even when your hands are wet. The only downside about the way it is built is that it is a one-piece rod and transport might be a challenge. This rod is versatile and adaptable so it delivers performance and sensitivity in a variety of fishing situations. Whether you're on the water pitching jigs and Texas rigs, angling from a jetty, or fishing from a boat or kayak, it gets the job done. Loading is excellent and it can achieve long casts with lightweight finesse crankbaits and the fast action tip provides the power for casting distance and hooks setting. It also has pretty good sensitivity. You can detect even the tiniest nibbles by light-biting fish and know when to set the hook. Medium and heavy powers and a blank with enhanced strength give it the backbone to handle medium to larger game fish without breaking. Just don't exceed the lure weight rating or use for too heavy applications. If catfishing is your favorite past time, having a casting rod optimized to catch catfish will enhance your experience on the water. This top rated casting rod is exactly that and will quickly become your favorite pole. Designed by veteran big-river catman John Jamison, you can be assured that this has exactly what you need in a catfish rod. It is the best casting rod for catfish. It looks good and its dependable performance gives you confidence that it can handle whatever it is you will hook. And the price tag is unbelievably low. The blank is made out of S-glass, which is a lighter, stronger and stiffer form of fiberglass developed specially for fishing rods. The result is a blank with strength, smoothness, and sensitivity. It features stainless-steel guides plated with chrome to enhance durability. EVA split grip handle is lightweight and balanced for a great feel and control when casting and retrieving. When fishing at night, high-visibility glow tips ensure that no bite goes undetected. The best rod for catfishing is a medium-heavy power, 7- to 9-foot fiberglass rod that loads up nicely on the hookset. These rods are exactly that. They are equipped to deliver excellent performance when catfishing and their performance on the same is top rated. They are sensitive enough to tell you when cats are playing with the bait so you can set the hook. This rod has plenty of backbone for pulling the big ones out of tangles. Shimamo has a solid reputation for high quality fishing equipment that delivers excellent performance. This attractive, top rated two piece baitcasting rod lives up to the expectation. It offers the legendary Shimamo quality, strength, feel and reliability at a no-worry price. This is a versatile rod created for anglers of all ages and skill levels and equipped to cover a wide variety of applications in streams, rivers, lakes, and even light saltwater fishing. If you're looking for a first baitcaster rod, a backup that can handle all kinds of fishing tasks, this one is a must-check. The rod features a sturdy and durable aero glass blank construction, reinforced aluminum oxide guides for smooth line flow, solid locking graphite reel seat and comfortable EVA foam-grip handle that is long enough to offer the kind of grip you need. The fact that its a two piece means transporting it is easier. For a heavy rod, this rod exhibits excellent sensitivity and flex. A fast action tip throws lures far away and gives the rod sensitivity and hook setting power. Medium and medium heavy powers give the rod the lifting power to fight and bring in a variety of medium to heavy fish. If you want a baitcasting rod for catching salmon and steelhead, this rod has been optimized for exactly that. A lot of effort and attention to detail has gone into ensuring it lasts and performs as great as it looks. Okuma developed the Celilo series with insights offered by fishermen to deliver the best performance when salmon fishing, trout fishing, and bottom bouncing. These rods are tested for reliable quality and performance when it comes to these fishing techniques. For the money, this rod is exceptional and one of the best casting rods. CE-C-1062Ha, CE-C-762Ha, CE-C-862Ha, CE-C-862MHa, CE-C-862MLa, CE-C-862Ma, CE-C-902Ha, CE-C-902MHa, CE-C-902XHa, CE-C-962MLa. This rod is created using materials of the highest quality and achieves the delicate balance between sensitivity and durability. The graphite blank gives it a strong, lightweight feel and incredible sensitivity. 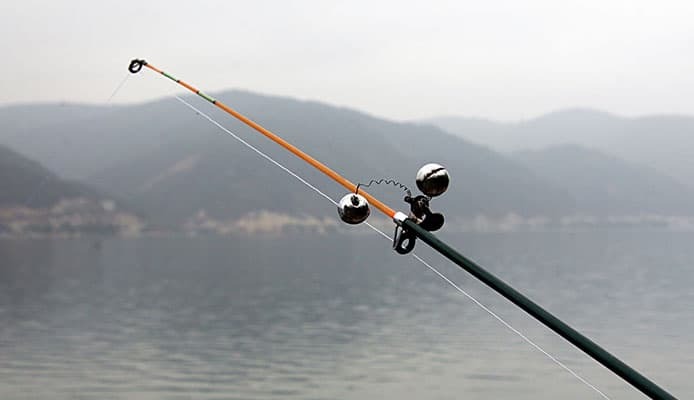 The rod components are durable and rust resistant: smooth and durable aluminum oxide guide inserts, secure stainless steel hooded reel seats, and stainless steel hook keeper. Cork fore and rear grips and a blank-through-handle design give you the control and leverage you need when casting and fighting fish. 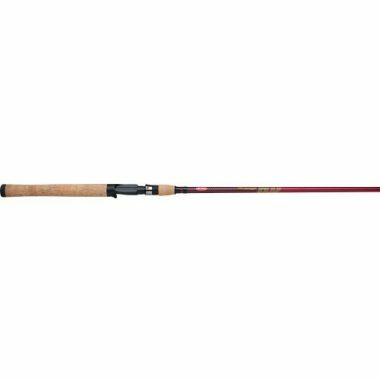 This rod is designed to deliver an excellent performance for salmon and steelhead fishing techniques. Paired with a well-matched casting reel, it has the length and tip action to get your bait, lures and floats far away and set the hook without ripping the lure out. This rod has great sensitivity and you can feel every tap and pull on your bait and set the hook accurately. It also packs plenty of backbone for setting the hook and for bringing in heavy salmon and steelhead. This is a high-end tournament baitcasting rod innovatively designed for superiority and versatility. 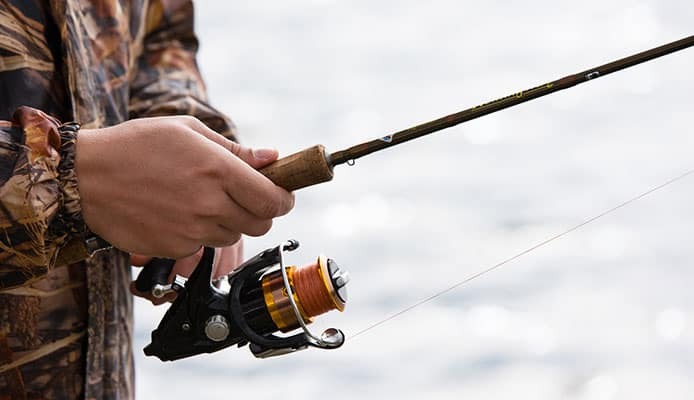 Daiwa is an industry leader in fishing equipment and is known for quality rods. With the Tatula bass rods, they offer top quality, strong yet lightweight and sensitive rods that give the reliable performance and comfortable fishing experience you're looking for and give you your money's worth. 6'10", 7', 7'1", 7'2", 7'4", 7'6", 7'7" long one-piece rods, medium light, medium, medium heavy, heavy frogging and heavy flopping powers, regular, fast and extra fast actions. To deliver superior performance, these rods feature top quality construction and components starting with the lightweight and powerful blank constructed using Daiwa's exclusive SVF (Super Volume Fiber) graphite technology and micro pitch finish making them strong, sensitive, and twist-resistant. The top quality Fuji alconite ring guides, custom reel seats, and machined aluminum reel clamp nut add to the durability and reliable performance. EVA foam handles make for a comfortable to handle and dependable rod that delivers a smooth performance. These rods have great action and offer a lot of backbone, sensitivity, and hook setting power. They pitch well and cast long distance and with accuracy. You can detect not only what is going on with your lure but also what is going on with the bottom. They have plenty of strength to bring in fish. Have you looked at some of the best casting rods, gotten overwhelmed with all the options and found it hard to pick one for yourself? This buying guide will simply the choosing process. Your fishing rod is something you are going to be spending a lot of time with and it will determine what kind of fishing experiences you will have. You want to make sure you get the right one. So what makes a good baitcasting rod and how to do you choose the right one for your fishing needs? It takes more than ordering the first shiny rod you encounter but it isn’t rocket science. It starts with knowing what you’ll be fishing for and how. Knowing where you’ll be fishing, the type of fish you’ll be going after, and the type of lures you’ll be using will make it easy to narrow down your options. When assessing the best baitcasting rods, pay attention to the following features on any casting rod you’re considering to determine if it offers what you need in a casting rod and get the best baitcaster rod that will deliver optimal performance on the water and give you excellent value for your money. The line guides are the circular rings positioned along the length of the road facing towards the sky on a baitcaster pole. Their purpose is to control the flow of fishing line as you cast and retrieve and minimize the amount of friction and heat on the line to ensure smooth line flow without tangles and enhance the durability of your fishing line. These eyelets may seem insignificant but they’re very important as they affect the rod’s quality, durability, sensitivity and how smooth and far out casting is. It is, therefore, important to examine the kind of line guides a casting rod you’re considering has. Pay attention to their quality and positioning. 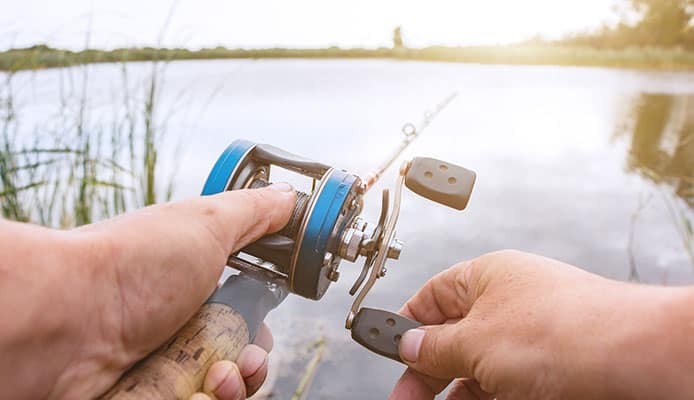 A quality, well-made casting rod will have carefully placed guides that line up and remain straight without twisting or snapping when under pressure. The more guides the rod has, the better its casting performance but the more expensive the rod. Fuji’s Concept guides are considered some of the best. Most guides feature a metal frame with inserts that the fishing line glides on when flowing. The inserts can be made of plastic, metal or ceramics. Silicon carbide (SiC), is considered the best material and offers a super-smooth, low-friction surface. Nickel-titanium is top quality, extremely corrosion resistant and when bent will spring back into position instead of breaking. Alconite is another smooth material. Ceramic guides are good quality and extremely resistant to wear and friction. Plastic inserts are inferior in quality, durability, and performance. The reel seat is where the baitcasting reel you choose to match with your baitcaster rod will sit and attach to the rod. On a baitcaster rod, the reel sits on the top of the rod and so casting rods are top seated. Pay attention to the quality of the reel seats on any casting rod you’re considering. There’s a lot of pressure on this feature when throwing the heavy line, bait, and lures and fighting heavy fish. You want to ensure the seat is built well to resist the elements, hold the reel securely so it doesn’t fall in the midst of a tough fish fight and enhance the rod’s performance. Check that the reel seat is designed in such a way that the reel will fit snugly when tightened. Additional screw-down options provide extra security. Beware of poor quality reel seats made out of plastic or faux metal that will bend, break, or snap and cause your reel to fall off. For added sensitivity, some reel seats have a cutout on the bottom that exposes the rod’s blank so you can feel the blank with your finger when holding the rod. Cushioning inside the metal hoods is good as it prevents rust and stains and makes it easy to remove the reel. Choose a design you find most comfortable to hold. The power of a casting rod refers to its strength or lifting power. There are ultra-light, light, medium light, medium, medium-heavy and heavy power fishing rods. Ultra-light and light powers are meant for lighter fishing lines, lures and fighting small fish. Medium heavy, heavy and extra heavy powers give the rod enough backbone to throw heavier lines, lures and bring in large, heavy fish. Since a casting rod is designed to throw heavier lures and baits to catch bigger fish, you will need a baitcaster pole with medium to heavy powers so it has enough strength to cast heavy lines, lures, baits and lift heavy fish out of heavy cover or deep waters without breaking. The action of a baitcasting rod describes where it bends when a load is placed at its tip and how quickly it recovers when the load is removed. It determines how a baitcaster rod will perform when casting and fighting fish. There are extra fast, fast, medium, and slow action fishing rods. Extra fast action rods are extremely stiff and only bend at the tip. Fast action rods are a little more flexible and bend in the top third of the rod from the tip. They pack a lot of power at the tip which enables them to achieve superior casting distance. They’re also very sensitive and set hooks fast and hard. Moderate action rods are equally stiff and flexible and will bend in the top half of the rod. They are versatile and suitable for casting middleweight baits. They are the easiest for beginners to master. Slow action rods are the most flexible and bend uniformly throughout the rod’s length. They are good for gentle casts and fishing with delicate and live baits. They set hooks slower and allow fish to get the hook further into their mouth. The material the casting rod’s blank is made of will affect its ease of use, durability, strength, and performance when fishing. When using a baitcaster rod to cast heavy lures and land trophy fish, the most important thing you need is strength and durability and fiberglass offers you this. It is strong but heavy and doesn’t have as much sensitivity as graphite. It performs best in heavier applications that don’t require much sensitivity. Graphite rods are unbeatable when it comes to sensitivity and lightweight comfort. Graphite is also strong but has a tendency to be brittle. It is great for casting, fishing for long durations, and for situations that require a superior feel. Composite construction combines both graphite and fiberglass to produce lightweight and sensitive yet sturdy and durable rods. On a good fishing day, you will have your hand on your casting rod’s handle for hours. It should feel good in your hands and provide a strong grip even when your hands are wet and slippery and no matter how cold or hot it gets. It should also be ergonomically designed to ensure you don’t go home with achy wrists. This is why the handle on a rod and the kind of grip it offers are very important considerations when choosing a casting rod. Cork and EVA foam are the top handle materials. Both are very lightweight, easy and comfortable to grip. Eva, Hyperlon or Duralon made handles offer a solid, non-slip grip and are also resistant to stains, corrosion and temperature changes. They are the most durable and more affordable than cork handles. Cork handles offer sufficient grip even when it’s wet and add to the sensitivity and aesthetic appeal of a rod. However, they’re expensive and not all cork handles are made equal. The quality of cork varies with the most expensive rods featuring the best cork grade. When it comes to length, longer handles help with heavy baits and long casts because the angler you can use two hands to generate more load and forward force. For two-handed casting, an extended rear grip length offers more control and leverage. For short casts of lighter baits, short handles allow for one-handed or roll casting. Handles on a casting rod also come in full grip, split grip, and pistol grip designs. Full grip handles are best for casting heavy baits or for long distances using two hands. For lighter baits or close target casting, a split grip or pistol grip casting rod is good. A pistol grip is the shortest type of grip a casting rod can have and is usually contoured to conform to the angler’s hand. Blank-through-handle construction enhances the rod’s stability. When it comes to frame quality, high-grade aluminum or graphite is good. Graphite frames are lightweight and withstand shock well. Aluminum frames are stronger, heavier and more resistant to flexing than graphite frames. Graphite suits light fishing tasks such as catching small fish while aluminum is ideal for heavier fishing tasks such as bringing in large game fish or saltwater fishing. Q: What Is A Baitcasting Rod? A: A baitcasting rod is a fishing rod designed with a top seated reel seat where a baitcaster reel is attached. Below this reel seat is a trigger grip that improves the angler’s control when casting and fighting fish. This kind of rod is designed for heavy fishing applications with heavier lures and bait and for fighting large fish. Q: When Do I Use A Baitcasting Rod? When fishing in a challenging environment and you need focus and precision, a baitcasting rod offers you the control you need to cast lures with pinpoint accuracy and make precision presentations. When you need superior casting distance, a casting rod is able to throw lures farther away. This is because the fishing line comes off the spool directly, straight out the rod guides and launches farther away. Baitcaster rods are the go-to for power fishing techniques that require you to throw heavier lines and lures and bring in larger and heavy fish from deep waters and thick cover. They have a strong construction with more power and easily cast 10-20lb test lines and 1/4 to 1oz lures and above. Q: What Is The Difference Between A Regular And Baitcasting Rod? The most obvious difference is the reel seat and guides positioning. A baitcasting rod is designed to work with a baitcasting reel, which is mounted on top of the rod above the handle. The line guides are also positioned on the top of the rod. 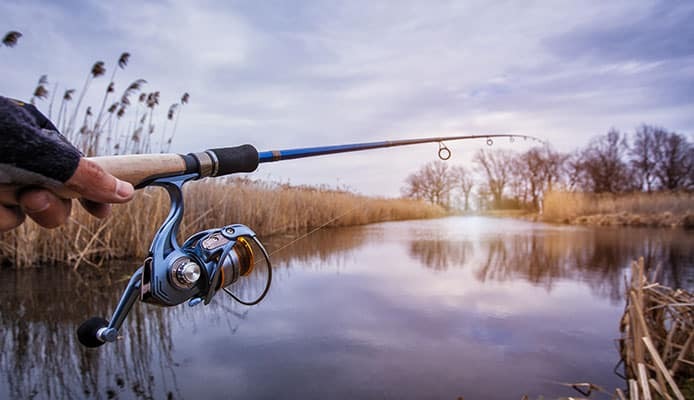 A spinning rod is a fishing rod made for a spinning reel, which hangs down underneath the rod held in place with a sliding or locking reel seat. The line guides are also arranged along the underside of the rod. A baitcasting rod features a forefinger grip trigger underneath the reel seat that enables an angler to maintain control while casting and fighting a fish. A spinning rod does not have this trigger. On a baitcasting rod, the line rolls off the spool smoothly and directly and without pulling on the guides. Due to this, the line guides are small with the last eye closest to the reel slightly smaller. On a spinning rod, the line comes up and off the lip of the spool, pulling on the guides and creating friction and twists that limit casting effectiveness. A spinning rod has large guides to accommodate the large loops of line coming out of the reel. The eyes decrease in size from the handle to the tip. The eye nearest the handle is much larger to reduce friction as the coiled line comes off the reel. A baitcasting rod requires more practice, patience, and skill to master and it can take a while to get the hang of it. A seasoned angler is better equipped with the skill set to handle a baitcaster rod successfully. Beginners encounter a lot of backlashes and have to change the fishing line often. Spinning rods are simple to use and master, present no backlash issues and can be used by anglers of all skill levels. A baitcaster rod offers more superior casting accuracy and distance of heavy lines and lures. A baitcaster fishing outfit enables anglers to cast more accurately by controlling the spool with their thumb. A proficient angler using a baitcaster rod can land a lure precisely beside a log or right in the middle of a thick cover. The direct flow of line offers excellent line control and makes it possible to cast lures far away. 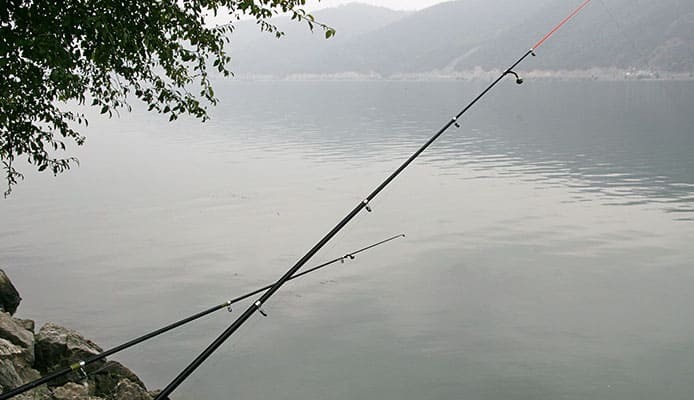 Designed for heavy fishing applications, a baitcasting rod is constructed to be powerful and handle heavier line and lures and can pull strong fish from heavy cover. The way the line comes off straight makes it easier to use heavier lines from a 10-20lb test. Designed for finesse fishing techniques using lighter lines, lures, and baits, a spinning rod is less powerful. A spinning rod also casts lighter lines and lures accurately and farther away but its casting effectiveness is limited by line friction and its less powerful construction. Having a good quality baitcasting rod that’s well-constructed and balanced gives you the power and control to cast heavier lines and lures farther and achieve pinpoint placements and pull big fish out of thick cover and deep water. With the variety of casting rods available on the market, choosing one can turn out to be a daunting task. You can narrow down your options by keeping mind the species and size of fish you are targeting, how your fishing environment is like, and what kind of lines and lures you will be using. Choosing among the top-rated baitcasting rods reviewed above will also help you get the best casting rod for yourself and for the money. They have been tested and proven to be of good quality and capable of the job on the water. All you have to do is go through each review to see if what each rod offers meets your needs. Once you find your best baitcasting rod, pair it with a great baitcasting reel, suitable fishing line and lures and you’ll be ready to confidently go after the trophy fish and experience the full potential of a well-made casting setup. All the best on the water!